I love to travel, but sometimes even more than that, I love coming home. Yeah, the Caribbean is nice, but I miss my kitchen. My kitchen is hardly perfect. It needs better lighting and storage, and it could be laid out more efficiently. The fridge, well first of all it’s white, but beyond the cosmetics it also leaks and vibrates in a disturbing way. And the counters…they aren’t quite gray and aren’t quite Formica but they definitely aspire to be. So it’s not ideal, and I’m hoping someday it will be. I’d love reclaimed wood counters and a stainless steel fridge. Open shelving and, I don’t know, a backsplash made with vintage tiles or some such crapola. But it isn’t the stuff that makes a kitchen. Sure, a nice coat of paint helps and I’ve rigged up some temporary shelving to keep things organized. But really, it’s the life you breath into it. The way your favorite spices are never really put away, the lists that accumulate, the pages of recipes torn from magazines and clinging for dear life to the fridge with an “I Love NY” magnet that can’t quite handle it. And of course, there’s the cooking! After being gone for 3 weeks I needed to bring the kitchen back to life in a big way. Music helps. And I threw together some of my favorite aromas — as tempeh cooks it smells like freshly baked bread. I was craving some sausagey flavors and homey greens, and of course nothing says home like scents of garlic and shallots. Roasted red peppers are like a big hug from 20 fluffy kittens and to finish it off, some cilantro and lemon to brighten up the flavors. This was totally satisfying as is, but would also be faboo with some mashed sweet potatoes or mashed potatoes and cauliflower (my beloved Caulipots.) Home is definitely where the tempeh is, leaky fridges be dammed. First, rip the leaves off the stems of the collards, rip them into smaller pieces and wash them. I like to fill my sink with cold water and let them soak in there, then drain when I’m ready to use. Place the drained collards in a large pot (at least 5 quart) and submerge with water and a big pinch of salt. Cover and bring to a boil, then lower the heat and let simmer for 10 minutes. Drain and set aside. In the meantime, crumble the tempeh into bite-sized pieces and place in a large skillet. Add water, soy sauce, and lemon juice. Cover and bring to a boil. Let boil for about 10 minutes, or until all of the liquid has absorbed or evaporated. This makes the tempeh plumped up and succulent and gives them flavor. Lower the heat and push all the tempeh over to one side. Drizzle the oil into the other side of the pan and saute the shallots and garlic, along with a pinch of salt, for about 3 minutes. Then just flip them into the tempeh and mix together. Saute for about 5 more minutes, until tempeh is browned. Add a little extra oil if needed. Mix in cilantro, fennel seed, red pepper flakes, black pepper and roasted red pepper. Lastly, mix in the collards and let everything cook together for about 10 more minutes. Add a little water or veggie broth it it begins to get dry. Taste for salt and pepper and serve with wedges of lemon and hot sauce. This sounds so easy, yet so delish and comforting. I can’t wait to try it! This is dinner on Friday night, my first night of spring break. That sounds so good. You have always inspired me to to not so get upset about the fact that my kitchens have SUCKED..
and collards are probably one of my favorite foods ever. Fabulous, like all your recipes. My worry is that boiling anything leaches most of the nutrients out into the water – so what about sauteing? But maybe boiling the be-jesus out of collards, or kale, for instance, or dandelion greens is the only way make it chewable – ? I always eat chard because it’s so soft, but will try collards next time an organic bunch shows up looking alive in the market. collards and tempeh?? sign me up! i like the idea of add a side of sweet potatoes too to make it a really balanced meal. saving this to my online cookbook (http://cookmarked.com)! This sounds delicious, but I want to point out that substituting soy for tamari won’t help make this dish gluten-free, since tempeh is made out of gluten. You’re mistaken, it’s made from fermented soy beans. There can be wheat or other grains in tempeh, but unless it indicates that on the package then it’s gluten free. Of course always read the label but tempeh is definitely not made out of gluten. Maybe you’re thinking of seitan. Thats so weird…I made same thing today! I used curly kale and a spoon of tomato paste though, oh and minus the red pepper and fennel seeds. Makes a GREAT meal. Super filing…hits the spot! just made this. foodgasm. just sayin’… i made 2 changes just cuz. 1… i omitted the fennel because i just don’t like it. and 2… i used kale instead of collards because i just love them. i sauteed the kale in olive oil and garlic and then simmered them in some white wine. the rest of the recipe i followed exactly. it was wonderful. served with plain ole baked sweet potatoes. now i ask you… who the hell needs meat??? This was slammin!!! Of course I did not have all the proper ingredients!!! I used frozen collards. (I wanted to keep my fresh greens for my green smoothie!!) I sauteed red bell pepper, onions and garlic and when saute was done added approx. 1/2 t parsley and 1/2 veggie boullion cube with a small sqweez of braggs liq. amino and then dumped in the cooked collards. Deeelish!!! My 3yr old and 5 yr old ate em up!! I have to admit though, taking the time to roast the pepper would have been an even greater flavor experience! The kids were kinda chompin at the bit though! I made this for dinner tonight, with some roasted potatoes on the side, and it was pure YUM. Instead of precooking the collards separately, after browning the tempeh I added them raw to the wok (along with the roasted red peppers, cilantro, etc. ), poured in some veggie broth, and put a lid on it for a few minutes. I’m sure the tempeh would’ve been a little crispier if I had stuck to the recipe, but I loved it this faster, one pot way. The boyfriend devoured it, too. This was so good! And easy. The sweetness of the bell pepper matched perfectly with slight bitterness of the collards. I’ve been looking for tasty recipes featuring collards (collards aren’t always one of my favorite foods, but something I’m trying to incorporate more as a vegan because of their high calcium content). This recipe will definitely become a regular in my rotation. Thanks for sharing! Tried this because I got a bunch of collards in my CSA box. It was delicious. My only wish was that there was more of it. The best way to eat collard greens so far. Just had this for dinner–SO GOOD! I made this last night, as my first foray into cooking with (or even eating) tempeh. It was amazing! I used chard instead of collards, but aside from that followed the recipe exactly. It was delicious! I’m looking forward to using more tempeh in my cooking in the future. Yum! Super tasty. Looking forward to eating it for lunch tomorrow. A baked sweet potato was the perfect accompaniment. My only recipe change was to use veggie broth instead of water to initially cook the tempeh. my partner and I love this dish — thanks! Just made this last night for my family. Delicious! Even my picky son liked it. I used parsley and cumin instead of cilantro and fennel. I steamed the collard greens and threw in some kale. Next time I’ll probably add sliced mushrooms to the shallots to add a rich flavor and broth. 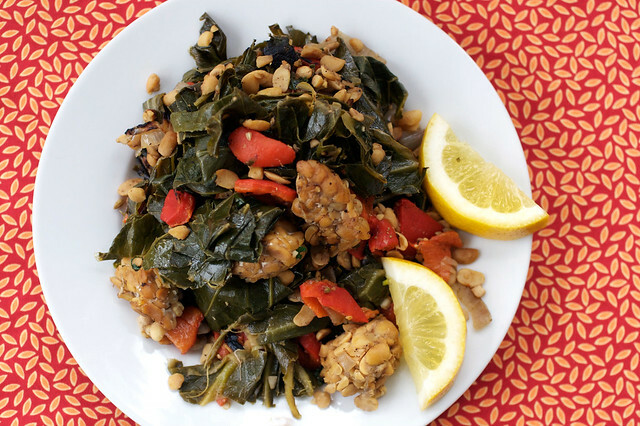 Made this the other day – smokey, collard, tempeh awesomeness! It’s even good day 2 and 3 cold on top of salad. My new favorite! Used this recipe as inspiration for dinner! -skipped the steaming tempeh and went straight to the sauting. -put the whole mess on top of some mashed sweet potato and topped it all with Siracha. SO GOOD. Seriously. Even got the boyfriend, who has long scoffed at the idea of tofurky sausage, to admit eat it for dinner, which he declared delicious. All hail the Veganomicon! Assuming that the lack of black-eyes peas was a typo, I added them when making this recipe for dinner this evening. make sure any Tempeh you use is completely gluten free. Some may say wheat free.. but is not necessarily gluten free. Read labels. My creator is creating an effort to urge coniferous tree State to go intent on .web from individual landing page. i’ve constantly loathed the concept as a results of charges. in any case, he is making an attempt in spite of the very fact that. i’m abuse Mobile kind on shifted sites for with regard to yearly associate degreed am forced with reference to vary to an alternate stage. i’ve recognized parts of blogengine.internet. perhaps there is collectively the way I possible ought to copy all my WordPress articles immersed? Any assistance is in addition valuable.